I’m always looking for new books to give me the cutting edge in network marketing. One of my mentors recently recommended the book “The Process: The Fun and Easy Way to Build an Income Stream for Life” by Todd Burrier. I decided to order a copy on Amazon and I am glad that I did. The book was published in 2010. It is 51 pages long and is a great read. Overall, I give the book an 8 of 10 for the great tips it has in it. Todd Burrier is a top earning network marketer. He lives in Maryland and is an adjunct professor at several colleges where he teaches leadership. One of the things I admire about the guy is that he is real. He doesn’t use hype and he tells people the truth. He is the type of mentor you would want to have in your network marketing business. His book shares his process for building a successful network marketing business. His “process” makes sense, and is actually quite simple, but it is very different from traditional network marketing advice. You won’t hear him say recruit, recruit, recruit. You won’t hear him to hype up your prospect. You won’t hear him tell you to bug friends and family until you have no friends left, either! Once again, his advice is practical, refreshing and I know it will work. That’s why you should read the book. Listed below, I want to share a few of my favorite quotes from Todd’s Book, “The Process: The Fun and Easy Way to Build an Income Stream for Life.” They are listed in no particular order. Each quote is in italics. At the end of each quote I will provide my thoughts about the quote. # 1 The people like me who have a large referral based income stream, simply work the process until they succeed. You have to be persistent and consistent. Rome wasn’t built in a day. You have to just keep doing the right activities over and over until you succeed. # 2 The minute you decide to pursue any goal in life, there are things that will stand in your way. Everyone has obstacles, challenges and setbacks. Nothing worth accomplishing is easy! Let your struggles be your building blocks and motivation rather than something that makes you want to quit. Success is not easy for anyone. Everyone has to pay their dues. # 3 There is nothing of lasting value that happens overnight. There’s no such thing as get rich quick. You must be patient and persistent, even if your sponsor promised you easy, quick money. MLM is not the lottery. It is a business. And businesses take time to build. # 4 The biggest challenge you will face is focusing on others first. You want to be a servant leader. You want to think about what is best for your prospect. You want to help others. As you do these things for others you will naturally help yourself. # 5 People can sense them when you are trying to sell them for your own benefit. No one likes to be sold something. Focus instead on educating and helping your prospect. Show a genuine interest in your prospect. # 6 All things of value in life will require having to learn and try over and over. Nothing worth accomplishing is easy or quick. Every time you get knocked down you have to get back up one more time. You have to work UNTIL you succeed. # 7 Working for someone else your entire life is hard. Working in a job that doesn’t pay you what you deserve and doesn’t give you fulfillment is a dead end road. Spending your WHOLE life taking orders from someone else, doing a long commute, and working long hours is not the only way to make a life, nor is it the best way. # 8 Approach – information – follow-up and service. This is the process to succeed in network marketing. It really is this simple. Most people mess up on the follow-up and service part. # 9 You need to be nice, honest, respectful, focused on serving the other person’s needs and absolutely no pressure. This is a breath of fresh air compared to what most people teach. Treat others with respect. Don’t lie. Be honest and kind. Never pressure people. Treat people the way you want to be treated. # 10 You need to be relaxed in your approach. No hype or exaggeration. Be calm, poised and relaxed when you are talking with people. Don’t come across like a high pressure, used car salesman. Be a professional. # 11 Follow-up is part of all businesses. The majority of all business in the world is conducted after the fourth contact. If you only talk with a prospect one time, you won’t get very good results. You need to follow-up forever, until they buy or die. And you need to follow-up the right way. # 12 People become loyal to people before they become loyal to products. This is a relationship business. Focus on building strong relationships with your customers and team, and you won’t have to worry about losing them to anyone else. # 13 The majority of people who join you in your business will want to achieve a modest level of financial success. Most people are not trying to make the big bucks in MLM. Most reps would be VERY content with making a few hundred dollars per month. While it’s okay to talk about the big money, just remember that not everyone wants the big money. # 14 If someone is willing to do enough of anything they will eventually succeed. Be persistent and consistent until you succeed. # 15 1% of any population in any country has what I would call true business credibility. Most people cannot share a “business opportunity” with their friends and family because they have never owned a business or have never been successful in business before. That’s why it’s better to lead with the products, not the business. # 16 Product belief is something that is not subjective. When people love the products, they will keep reordering every month whether they build a business or not. When you use and love the products, your prospects will be able to tell because of your enthusiasm. # 17 By the time the new builder has several (I like them to have 15 or more) customers; they will be more comfortable to begin approaching for the business. This is because now they have built a successful little business that is producing positive cash flow. If you don’t have customers in your team, you won’t make any money. If you aren’t making money you don’t have a business. Get profitable in your business and then you have a legitimate reason to share your business opportunity with others. # 18 The key to the business is sharing with as many people as possible. MLM and sales are a numbers game. You have to work the numbers in your favor if you really want to succeed. You won’t build a big business by just talking to a few people. # 19 Human beings by nature are self focused. You have to realize that most people care more about themselves than anyone else. This is not really a bad thing. Knowing this will help you a lot when you talk with your prospects. When you talk with others, show them what THEY have to gain by taking the products or doing the business. Show others how to get what they want and you will get what you want. 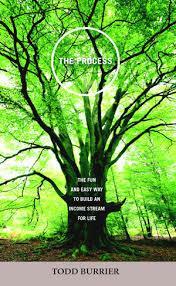 I really enjoyed the book “The Process: The Fun and Easy Way to Build an Income Stream for Life” by Todd Burrier. The book is a must read for any network marketer looking to take their business to the next level. If you’ve read the book before, I would love to hear your thoughts. Please leave a comment below to tell me what you think about the book. Great review Chuck. There are some great tips here. It does make sense to have fun with what you are doing. When you enjoy it, the chances of success are much higher. I really liked the part about relaxing. If we come across as pushy, or desperate, the prospect notices and is usually turned off by it. If we go into presentations with the attitude of wanting to help them, we will get further than if we are just trying to “pad” our own wallets. I enjoyed number 12, and I do agree that people become loyal to people before they would become loyal to products. If you take the low-key approach to sales that Mr. Burrier praises, then you can get to know prospects, and they can get to know you. Then it is only natural to want to share your product. But keep it real: most people can spot a fake a mile away. At least the kind that you would want to have relationships with can. This sounds like a great book! I especially like the last tip there. So many times we want to tell people the benefits that WE liked, rather than ask a few questions up front and discover the benefits that would really make a difference in the other person’s life. I think this is why a lot of times canned presentations leave the other person cold, because it’s not hitting them where THEY live and addressing THEIR needs and goals. Glad I could help. It definitely helps to think of things from the other person’s perspective.